Leeds United have dominated the monthly EFL Championship awards following their terrific start to the season. Marcelo Bielsa picked up the Manage of the Month award ahead of Middlesborough boss Tony Pulis with both teams making an unbeaten start. And striker Kemar Roofe collected the Player of the Month accolade, becoming a vocal point of the Whites' attack to score four goals in six games. 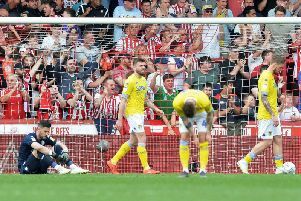 The Whites sit top of the table and are playing exciting football under their Argentine supremo as Leeds fans begin to dream that it could be their year. ZL‏ @SupremeJansson: Attractive mouth watering Bielsaball rightfully beats horrible Pulisball. Charlie Phillips‏ @charliechar: That’s brilliant. I want a picture of Marcelo looking begrudgingly happy with the trophy whilst looking at the floor. Super_Leeds_MOT‏ @SuperLeedsUtd5: Superb stuff. Very pleased for Kemar Roofe, top lad with a first class attitude - hard work really paying off. Biesla take a bow, what a start. Neils Diamond‏ @NeilsDiamond: Lads, lads, lads. Joseph Spiteri‏ @leedsjoespiteri: Wow that's what I call an achievement for the club . Well done guys. LUFC MoT: @LuFc___MoT: Ahhh the poisoned chalice of doom!! Excellent. Michael Simpson‏ @Mrs1968Michael: "The EFL kiss of death but hopefully not this time around very well done to both M.O.T"